Do you have a favorite love story movie or book? One that you can watch over and over again and feel the strength of the love between the 2 stars? Something like Sleepless in Seattle, Rocky, Serendipity. Maybe it’s not a typical love story but something like Toy Story? The love between Woody and Andy is real! When Andy goes off to college… that was tough. Conflict, drama, suspense, these all add to the power of any story. Do you have a love story? Do you have a dream of a love story? We all have a love story, no matter who we are or where we’re at in life, we just don’t always enter into our role. We forget that we’re living out the Greatest Love Story ever told. The one where the One who has everything, leaves it all behind to chase after us. The one where the One who has everything to give, gives it all to us. And yet we turn away from this Greatest Love Story to look at shiny objects. We yawn and get bored when we hear about this One, because well, we have heard it before. We’re in the middle of the Greatest Love Story – the greatest drama, the greatest conflict, the greatest suspense, and we yawn because… yeah we know the crucifixion was brutal, and we know about the mocking soldiers and the scattered disciples and the stone being rolled away. Heard it. What would it be like if we came alive to this reality? The reality of this intense drama of evil vs good. This battle for our love. This battle for our souls. What if we came alive to the evil that was swirling around the cross. The evil ones laughing and cheering desperately as Jesus died. Can we come alive to the anguish He felt as His Father’s face turn away? The Father seeing all of our sinful selfish selves couldn’t bear the evil His Son had become, so He turned away and the Son felt cold, isolated, rejected. Can I come alive to the drama of Jesus dumping all the greedy selfish sinful sin into the pit of hell? Can I come alive to that tremendous earth shaking moment when His spirit rejoined His earthly body and He walked out of the grave?! All for us – every single one of us. The greatest thing about this story? It is real life. It is real. It is not yawn-worthy, it is Awe-worthy! Come alive in these next few weeks as we celebrate the glorious Resurrection! You are in it! You are one of the two. He chose you. 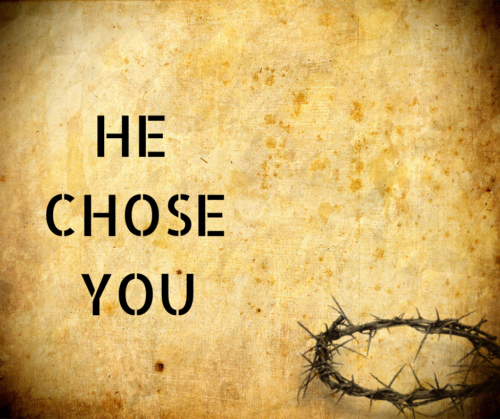 He chooses you. He chases after you. Don’t run. Don’t sleep. Don’t miss your moment!